You’ve decided to pop the question (or think your partner might be ready), but you’re not sure what the perfect ring might be? With so many cuts and settings on the market, it can be overwhelming. Here’s our guide to the 10 most popular diamond cuts on the market and the styles/features of each one. 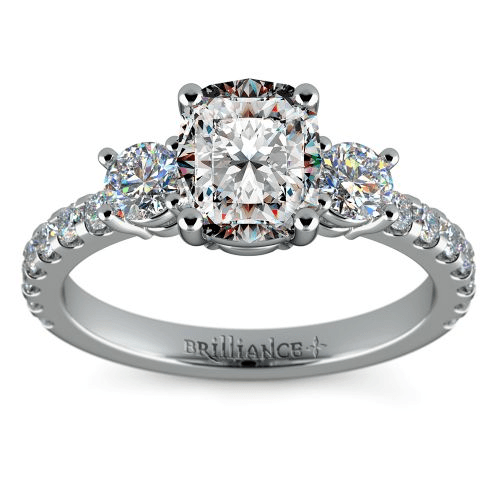 Petite Cathedral Solitaire Engagement Ring in Palladium with one carat round diamond. The round cut, also known as the round brilliant, is the most popular of all diamond shapes, accounting for nearly 75% of all diamonds sold. The cut is the first of the more modern styles, first debuting around the 1920s, and features 58 facets. This cut is beloved for its incredible sparkle, with its mathematically superior brilliance, fire, and scintillation. However, the round cut is also the most expensive diamond shape in addition to being the most popular. Although partially due to demand, the real reason for the price tag is that much of the original rough stone is lost in cutting, making round diamonds the least cost effective for diamond cutters to produce. Despite this, you can actually save money with a round cut if you are a savvy shopper. Round brilliant diamonds disperse color and hide inclusions better than any other diamond cut, meaning you can lower the color and clarity grade on your diamond and still get a stone that doesn’t show color and has no visible inclusions in order to offset the higher price of the shape. With their enduring popularity and their round shape that complements everything from a solitaire to an antique setting, the round cut is a beautiful and timeless choice. You can pair a round brilliant diamond with any setting style and end up with a beautiful ring. Second only to the round cut in popularity, the princess cut is defined by its square, symmetrical shape and incredible sparkle. First created in 1980, the princess cut has maintained strong popularity since its debut because of its versatility, looking beautiful in nearly any diamond cut ring setting. The square shape and sharp corners require that a princess diamond use a setting style that protects its vulnerable edges from chipping. Like round stones, they are good at hiding inclusions, but not as good at dispersing color. 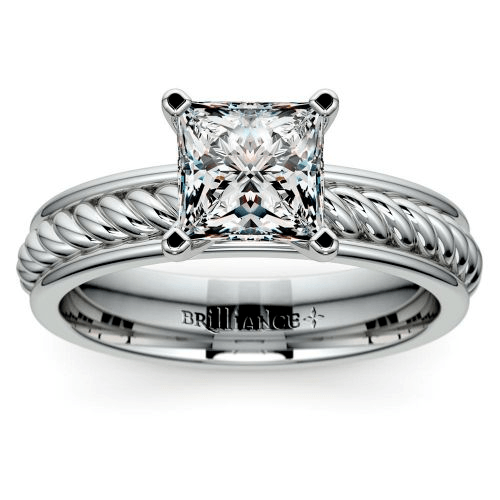 That being said, if you’re looking for maximum sparkle but are concerned about affordability, the princess cut is a great choice because its square shape matches that of a natural rough stone, meaning less diamond is wasted in the cutting process and reducing the overall price per carat (in comparison to the round cut). Princess cuts are the perfect selection for the chic, modern bride — their sleek modern lines and square shape lend them a truly distinctive and bold shape, while also allowing for maximum light performance. Developed in the 1960s, the oval cut is a modified round brilliant shape, which means it possesses a similar fire and brilliance to round cut diamonds. Its elongated shape maximizes surface area, making this the perfect choice for those craving that “wow” factor on a budget. Additionally, if you’re all about the sparkle, but want something a bit more unique, the oval cut is a beautiful choice since it is nowhere near as common as its round cousin. As an added bonus, its elongated shape often helps fingers appear longer and slimmer, a desirable effect for many. Oval cut diamonds look best in solitaire and halo settings but are adaptable to many different styles. If you want to amplify its sparkle even more, go for the Blake Lively style with a pave encrusted basket and French-set diamonds down the band. Ultimately, oval cut engagement rings are the ideal choice for a bride who craves sparkle but still wants to be one of a kind. With pointed ends and smooth curves, the marquise cut is one of the most distinctive diamond shapes on the market (some say it resembles a football). It is widely considered one of the most romantic of all cuts because of its origin story — King Louis XIV of France commissioned the new shape for his mistress the Marquise de Pompadour, and it was rumored that the shape echoed her smile. Similar to the oval cut, the marquise shape is notable for its elongation, boasting one of the largest crown surface areas of any diamond cut. This creates the illusion of greater size and is slimming for the fingers. However, the stones tend to be more shallow and show color and inclusions easily. Invest in a higher quality stone if opting for a marquise cut diamond. In general, the shape is often associated with antique or retro style rings, but marquise cuts vary in terms of length to width ratios, and different ratios look better in different settings. With a wider diamond, the marquise cut is a stunning choice for a solitaire, but it also looks spectacular with a French-set band. 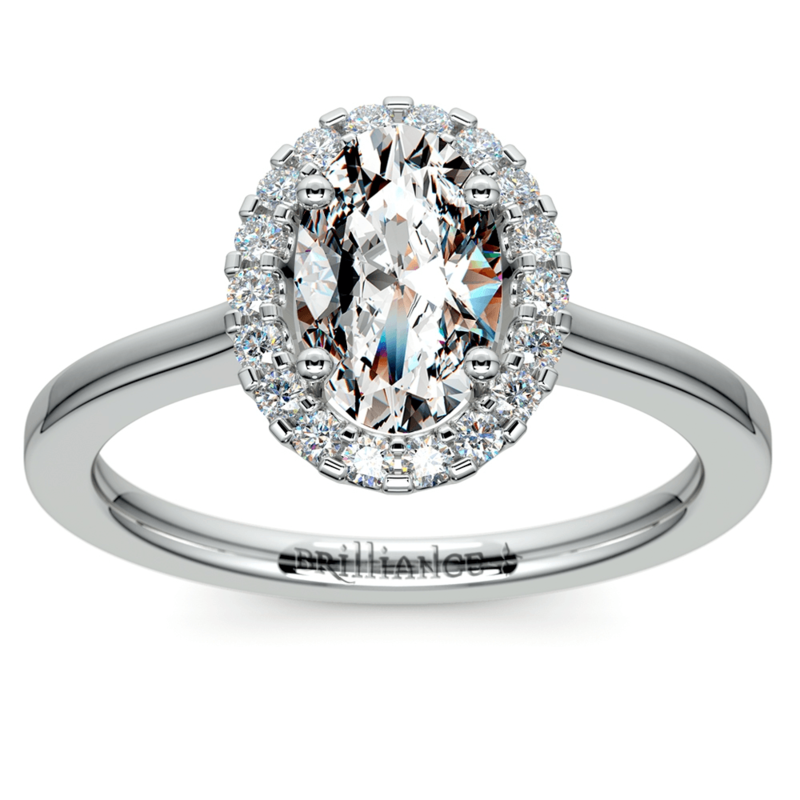 For longer, thinner marquise diamonds, a vintage style halo setting is the perfect match. For those looking for a truly rarefied shape and a stone that packs more bang for its buck, the marquise cut can’t be beat. 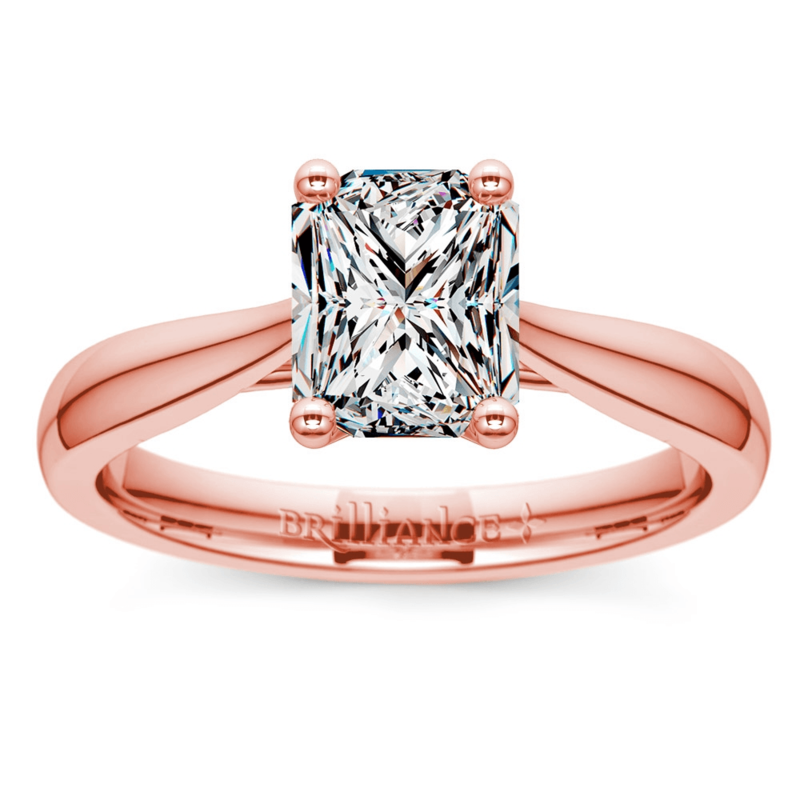 The cushion cut, like its name implies, is a square cut with rounded corners, giving the stone a pillow-like look. The modern cushion is the evolution of the old mine cut, and it was the most popular diamond shape for over a century until the debut of the round brilliant. It lacks the signature sparkle of a round cut, but it has a softer silhouette that lends it a vintage appeal. Cushion diamonds return light in a chunkier pattern than more modern cuts, resulting in a softer, more romantic vibe. Despite the lower brilliance, the cushion is a beautiful diamond cut, and very cost-effective since the stones retain most of the original rough diamond’s carat weight. While diamond cutters have developed different faceting patterns to help compete with the brilliance of the modern round cut, the true appeal of a cushion cut diamond comes from its history and romance. Because of its age, the cushion cut is considered an antique or vintage style cut, and it is beloved by those who embrace an older style. Cushion cuts look fabulous in a halo setting, which can help enhance their brilliance since they sparkle less than other cuts. They also look lovely elevated above a pave band and in three-stone engagement rings. If your bride is a glamour girl of the vintage set, the cushion cut is an ideal choice. Originally designed for its green gemstone namesake, the emerald cut is defined by its large open-table and rectangular step facets. More than brilliance, its most notable feature is its stunning degree of transparency, which makes it one of the most elegant diamond cuts on the market. Rather than a fiery sparkle, the emerald cut produces a hall of mirrors effect resulting in dramatic flashes of light from its interplay of light and dark. Emerald cuts enhance color and do not hide inclusions. They are a great choice for colored diamonds and gemstones, but are often faulted for requiring a high quality stone for the best look. That being said, the shape is one of the least expensive diamond cuts on the market, making it easier to go for higher quality without overspending. The emerald cut is a sophisticated and elegant choice, often best in a solitaire setting or flanked by baguettes or trapezoid cut diamonds. You don’t want a setting that will overwhelm its grace and simplicity, enhanced by the clarity of the center stone. 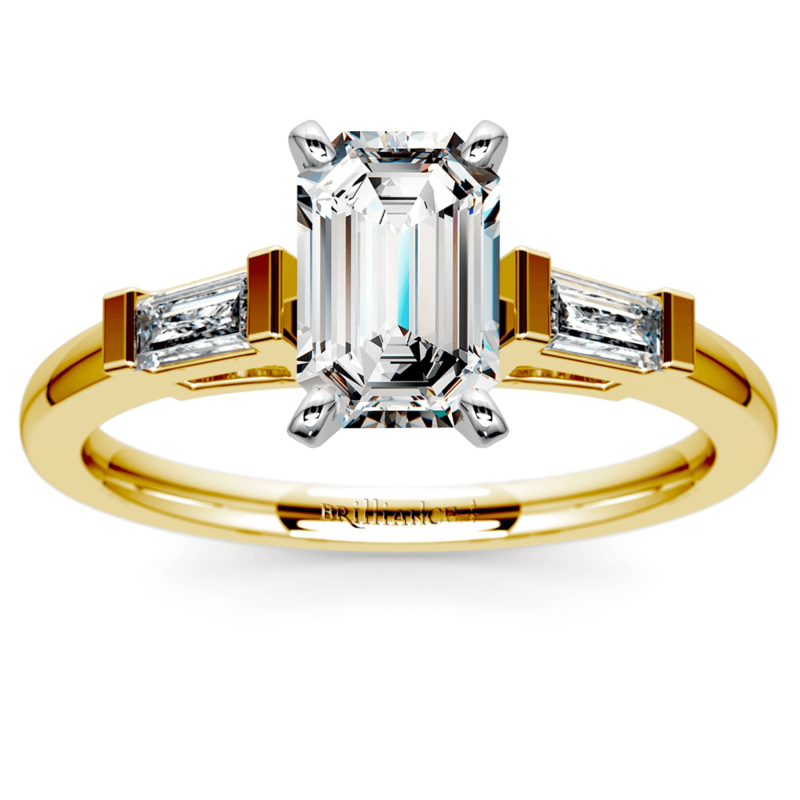 Emerald cuts are perfect choices for women who are the embodiment of timeless elegance and sophistication. First produced in 1902 by Joseph Asscher, the Asscher cut has regained popularity in the 21st century. A variation on the emerald cut, the Asscher cut is marked by its square shape and pronounced, cut corners. Like the emerald cut, Asscher diamonds have an open table and step facets. However, their smaller tables and larger facets increase this cut’s brilliance, making it the perfect combination of the emerald cut’s transparency and the brilliance and sparkle of more modern cuts. Its most distinctive feature is its “X” or series of concentric squares that are visible when viewing the table from above. Also like their elongated cousins, Asscher diamonds are less expensive compared to many other diamond cuts. Because of its symmetry and distinctive “X,” the Asscher cut is often described as having an architectural look. Developed and made popular in time with the Art Deco period, the bold shape and lines of the Asscher make it the perfect fit for ring designs inspired by this particular design era. While they look gorgeous in a solitaire setting, their vintage roots also make it the perfect choice for a wide range of antique halo styles. 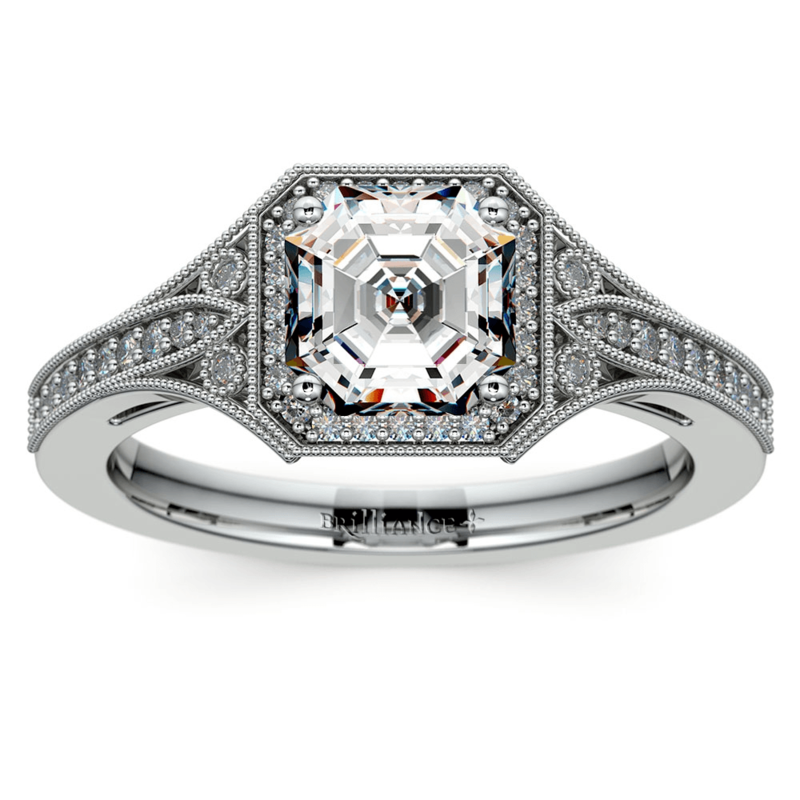 The Asscher cut is for the glamour girl extraordinaire who prefers a more opulent setting style. The heart cut is perhaps the most obviously romantic of diamond shapes. While some may consider it overly saccharine, others consider it the perfect romantic gesture. They are renowned for their rare and romantic shape, while also being a cut that enhances a stone’s sparkle to a remarkable degree. 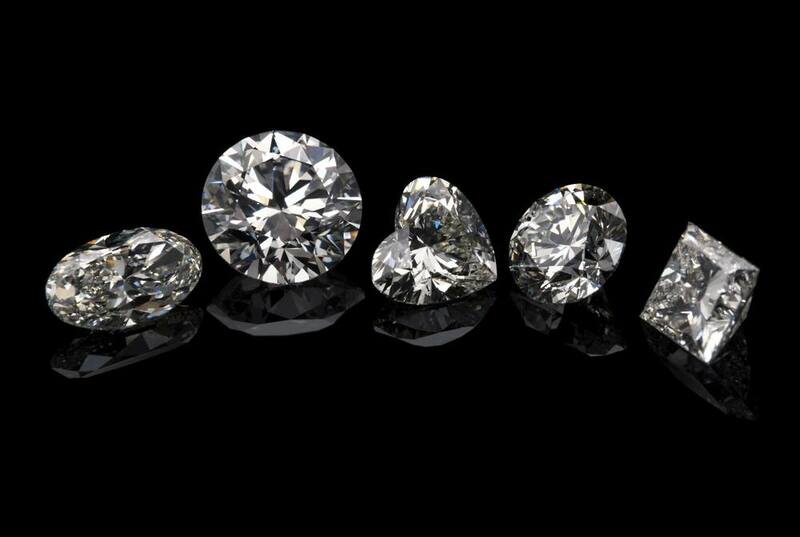 These diamonds can range from narrow to wide shapes, but symmetry is crucial when selecting a heart cut diamond. The two sides should be as similar as possible with an easily identifiable center cleft. Many people consider stones that are slightly wider in their ratio to be the ideal shape. Heart cut diamonds are cut to showcase their sparkle, so if you want a fiery symbol of your love, this shape can’t be beat. Heart cut diamonds have absolutely no set standard for cutting parameters, so visual size can vary widely across carat weights. Work with a diamond expert to make sure you are getting the biggest impact for your dollar when you buy a heart shape. Because of their unique shape, settings that allow the center to stand on its own are the best choice to showcase the heart-shaped stone. To add more romance, consider ruby or pink sapphire side stones. Heart cut diamonds are the perfect shape for a playful, spontaneous partner who value the sweet side of romance. A combination of the round and marquise cuts, the pear shape diamond is a tear-shaped beauty defined by its rare shape and intense sparkle. 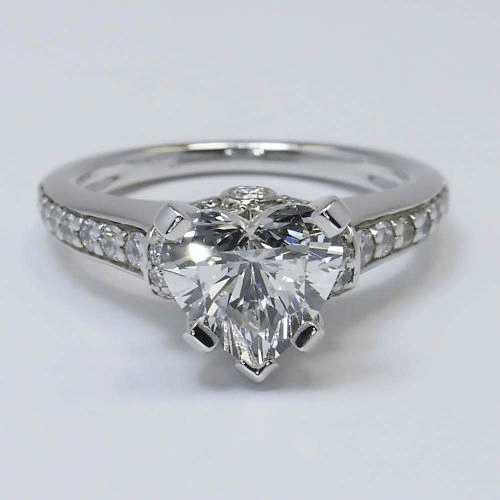 Traditionally, diamond pear settings are designed with the narrow end pointing toward the fingertips. 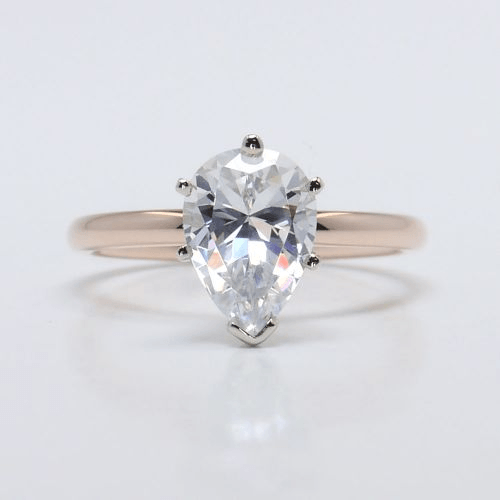 Similar to the oval and marquise cut, the pear shape comes in a variety of widths and is notable for its slimming effect on the hand of the wearer. First created in 1458, this shape is one of the oldest on the market and boasts a definite vintage appeal. With its 58-facets, the pear shape rivals the round and princess cuts for brilliance, while also delivering a more unique shape. Avoid stones that are overly elongated in order to avoid the bow-tie effect, or a bow-tie shaped area in the center of the stone that appears dull. Because the shape is less popular these days, it can be easy to fetch a good price on a nice stone. 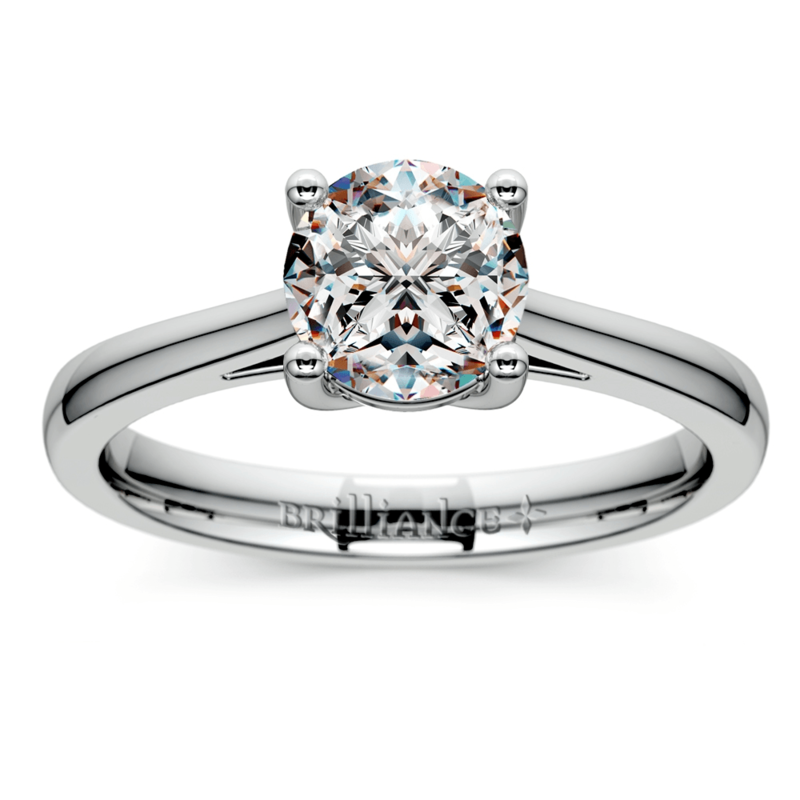 The more well-cut and symmetrical the stone, the more beautiful this shape looks in a solitaire setting. 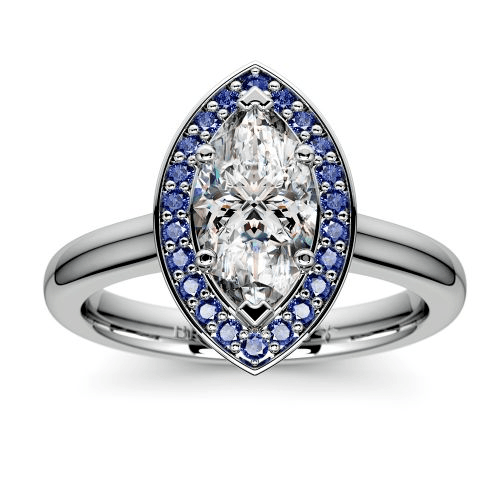 Because of its vintage flair, the pear cut also looks stunning in an Art Deco halo that accentuates the shape’s curves. Pear cut diamonds also had popularity in the middle of the 20th century, making them a natural choice for more retro styles. Pear diamonds are the best choice for a person with a flashy style that takes cues from the past. The radiant cut is a hybrid of numerous other shapes, bearing the square silhouettes and cropped corners of emerald and Asscher cuts blended with the the brilliant facet pattern of the round and princess cuts. Debuting in the 1970s, the shape is relatively new on the market and hasn’t quite found its niche yet. Radiant cut diamonds accentuate color and hide inclusions, making them a go to choice for fancy yellow diamonds. When looking for a colorless diamond, opt for a higher color grade, but give a little in clarity to keep the purchase on budget. Its hybrid shape makes the radiant cut a great fit for many settings, but it looks most beautiful in a solitaire setting of flanked by smaller diamonds in a three-stone design. Trillions and baguettes are the best side stone options. If you select a halo setting, be sure to choose one that enhances and showcases the unique shape of the radiant cut rather than obscuring it. For the woman who wants it all and can’t make up her mind, the radiant cut has something to appeal to everyone. There are so many diamond shapes to choose from! Which matches your unique style? Share your opinion in the comments below.